Today, plastic packaging has a bad (w)rap. But the first commercially viable version of the now ubiquitous material - cellophane - was conceived in a more innocent age, before anyone worried about plastic in landfill, or the sea, or the food chain. It begins in 1904, at an upmarket restaurant in Vosges, France, when an elderly patron spilled red wine over a pristine linen tablecloth. Sitting at a nearby table was a Swiss chemist called Jacques Brandenberger, who worked for a French textile company. As he watched the waiter change the tablecloth, he wondered about designing a fabric that would simply wipe clean. He tried spraying cellulose on tablecloths but it peeled off in transparent sheets. But might those transparent sheets have a market? By World War One, he'd found one: eye-pieces for gas masks. He called his invention "cellophane" and in 1923 he sold the rights to the DuPont corporation in America. Its early uses there included wrapping chocolates, perfume and flowers. But DuPont had a problem. Some customers weren't happy. They'd been told cellophane was waterproof, and it was, but it wasn't moisture-proof. Candies stuck to it; knives rusted in it; cigars dried out. DuPont hired a 27-year-old chemist, William Hale Charch, and tasked him with finding a solution. Within a year, he'd done it - the cellophane was coated with extremely thin layers of nitrocellulose, wax, a plasticiser and a blending agent. The timing was perfect. In the 1930s, supermarkets were changing - customers no longer queued to tell shop assistants what food they required. They picked products off the shelves instead. See-through packaging was a hit. And, as Harvard Business School researcher Ai Hisano points out, had "a significant impact not only on how consumers purchased foods but also on how they understood food quality". Cellophane let them choose food on the basis of how it looked, without sacrificing hygiene or freshness. One study - admittedly funded by DuPont - found that wrapping crackers in cellophane boosted sales by more than half. And retailers had no shortage of similar advice. "She buys meat with her eyes," said a 1938 edition of The Progressive Grocer. In fact, the meat counter was the hardest to make self-service. The problem was that meat, once cut, would quickly discolour. But trials suggested a self-service meat counter could sell 30% more food. With such an incentive, solutions were found: pink-tinted lighting, antioxidant additives and - of course - an improved version of cellophane, which let through just the right amount of oxygen. By 1949, DuPont adverts boasted about the "pleasing new way" to buy meat - "pre-cut, weighed, priced and wrapped in cellophane right in the store". But cellophane would soon fall out of fashion, overtaken by the likes of Dow Chemical's polyvinylidene chloride. Like its predecessor, this was an accidental discovery first used in conflict - in this case, weatherproofing fighter planes in World War Two. And, like cellophane, it needed plenty of research and development before it could be used on food - it was originally dark green and smelled disgusting. Once Dow sorted that out, it hit the market as Saran Wrap - now more widely known as cling film. After health scares with polyvinylidene chloride, cling film is now often made with low-density polyethylene, though that's less, well, clingy. It's also used to make those single-use supermarket bags now being banned around the world. High-density polyethylene is the kind of stuff you might get milk in. Fizzy drinks come in polyethylene terephthalate. And if you're not lost already, consider that plastic packaging is increasingly made from multiple layers of these and other substances, such as biaxially-oriented polypropylene or ethylene-vinyl acetate. There's a reason for this, say packaging gurus - different materials have different properties, so multiple layers can give you the same performance from a thinner - and thus lighter - piece of packaging. But these compound packaging materials are harder to recycle. The trade-off is hard to fathom. Depending on how much of the heavier, recyclable packaging would in practice be recycled, you might find that the lighter, non-recyclable packaging actually generates less waste. And once you start looking into plastic packaging, this kind of counterintuitive conclusion comes up all the time. Some packaging is a foolish waste. But are shrink-wrapped cucumbers really so silly if it means they stay fresh for 14 days rather than three? Which is worse 1.5g (0.05oz) of plastic wrap or entire cucumbers going off before being eaten? Suddenly it's not so obvious. Plastic bags stop bananas going brown so quickly, or new potatoes going green; they catch grapes that fall off bunches. 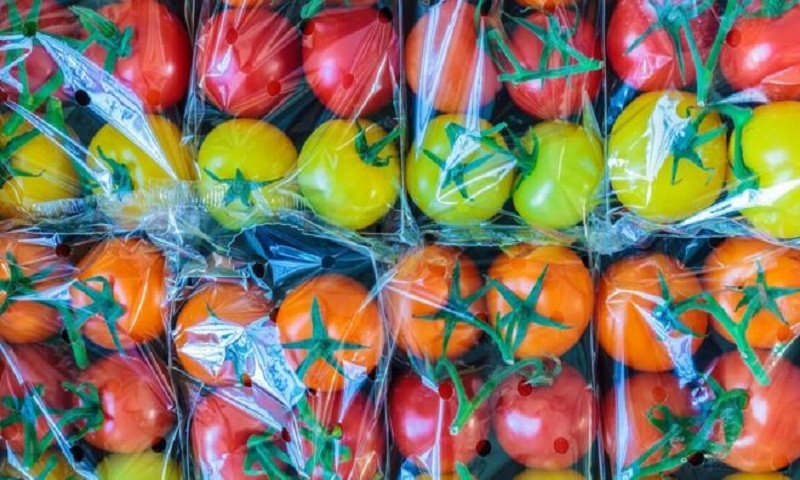 About a decade ago, one UK supermarket experimented with taking all its fruit and vegetables out of their packaging - and its food wastage rate doubled. And it's not just shelf life - what about waste created before food gets to the shop in the first place? Another supermarket, stung by criticism for putting apples in plastic-wrapped trays, tried selling them loose from big cardboard boxes - but so many were damaged in transit that the approach used more packaging per apple actually sold. According to a UK government report, only 3% of food is wasted before it gets to shops. In developing countries, that figure can be 50% - and that difference is partly due to how the food is packaged. As more of us live in cities, far from where food is grown, this matters. Even the dreaded single-use shopping bag might not be the villain it seems. If you've bought sturdy, reusable bags from your supermarket, it's likely they're made from non-woven polypropylene - and they are less damaging, but only if you use them at least 52 times. That's according to a report by the Danish government, which weighed up the varied environmental impacts of producing and disposing of different kinds of bag. And if your reusable bag is organic cotton, don't feel smug - the researchers reckon they need 20,000 uses to justify themselves. That's a shopping trip every day for over half a century. The market can be a wonderful way of signalling popular desires. Shoppers in 1940s America wanted convenient, pre-cut meat - and what economists call the "invisible hand" of the market delivered the technologies that made it possible. But our desire for less waste may not yield to market forces, because the issue is complicated and our choices at the checkout may accidentally do more harm than good. We can send that message on a more circuitous route only, through governments and pressure groups, and hope that they - and well-meaning industry initiatives - will work out some sensible answers. It seems clear the solution will not be no packaging - it will be better packaging, dreamed up in research and development labs of the kind that gave us moisture-proof cellophane all those decades ago.